As a young boy in Brooklyn in the 1930’s, Sam Rubin already knew that he needed to work the land. But all around him was concrete, and the post-Depression years swallowed dreams and childish thoughts. They moved to Suffolk County in 1961 and ultimately had five children: one son and four daughters. While Rhoda was building her reputation as a pioneer and successful entrepreneur in Weight Watchers, Sam continued to farm on various acquired properties. Eventually, he found a beautiful parcel of land on the North Fork of Long Island. It couldn’t have come at a more perfect time; the traveling had made him weary and he wanted to spend more time with his family. He bought it and named it, “Baiting Hollow Farm”. A few years later, he tried his hand at planting a small section of grapevines since it interested him and was a crop that was rapidly expanding in an area that was proving itself to be climatically similar to key growing regions in France. He loved to work the vineyard and help the grapes grow. He decided that he wanted to try his hand at expanding his output. So with Rhoda’s blessings, and the help of his son Richard, the former executive VP of Weight Watchers of Suffolk and a successful business entrepreneur, Sam acquired additional acreage adjacent to his property. After several years of continuing to nurture the soil and vines, Richard’s sound business plan created a team to oversee and supervise wine making production and vineyard management. 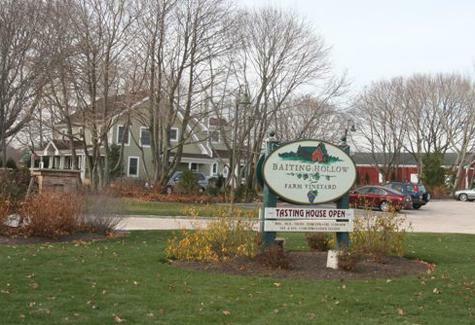 Baiting Hollow Farm became Baiting Hollow Farm Vineyard, and has established itself as a grower of distinction producing many varietals of high quality wine. Nowadays you can see Sam, eighty years young, out in the fields still working the land while Richard oversees the business side of things with the help of other members of the Rubin clan. Without a doubt, Sam appreciates his good fortune and is now on a very definitive path while still hearing the sound of a different drummer. No doubt that drummer, in proper cadence with Sam’s very own song, is the background of his thoughts while he plans his nightly route to give out his organic produce to the people he loves and cares about….